The city’s Volk’s Railway – the world’s oldest electric railway – is back on track and is opening during the half-term holiday, 14-29 October, and over the weekend of the Veteran Car Run, 4-5 November 2017. Visitors to Volk’s will have the first opportunity to see its new Aquarium station and visitor centre, designed by Hove practice ABIR architects and funded with contributions from the Heritage Lottery Fund (HLF), Brighton & Hove City Council and Volk’s Electrical Railway Association (VERA). Work on a £1.65 million restoration of the historic railway began in autumn 2016. The work was delayed by several months following the discovery of an old underground gas pipe. The pipe, which has lain dormant for many years, was unearthed during demolition work. The discovery meant specialists from Southern Gas Networks were brought in to disconnect the pipe and make the area safe before work could resume. For updates on the progress, follow @volksrailway on twitter or visit the Volk's Electric Railway Association website. The Volk's Railway was the first public electric railway in the world. It was opened on 4 August 1883 by Magnus Volk. Find out more about the history of the railway. 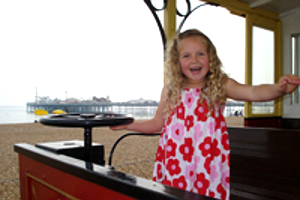 The railway can carry up to 80 passengers along the beach for one mile. The Volk's Electric Railway Association (VERA) is a group of volunteers who support the railway. We hold volunteering days on Mondays, please contact the Volk's Railway office for further information. The Volk's Railway is due to re-open this autumn. During the season trains will run every day, weather permitting. There are also occasionally planned closures due to major events on the seafront, for example the London to Brighton bike ride. These closures happen because of the high numbers of people using the 13 crossings over the railway tracks to the beach on these days. We add details of any closures to this web page. The full train journey from Aquarium Station to Black Rock (Marina) Station usually takes about 12 minutes. Allow 30 minutes for a return journey. The stations are all accessible by wheelchair. Wheelchairs must be folded to fit on the trains. Public toilets with disabled facilities are at each station. There are also toilets in the children's playground at Paston Place, by Halfway Station. Coach and car parking spaces are available near the Black Rock (Marina) Station along Madeira Drive. Ticket prices are available on the Volk's Electric Railway website. Buy your tickets at the railway station before departure. Children under 5 years old can travel for free on the Volk's Railway. As per Section I (Timetables and Train Services) of the Heritage Railway Association guidelines, the railway does occasionally close at very short notice due to unforeseeable circumstances and during severe weather. Whilst we do make every effort to avoid such closures and to advertise them as widely as possible, such difficulties are a part of running such a historic railway along a very busy seafront. If you are in doubt, please don't hesitate to contact the railway. Changes to service times and temporary closures will be advertised at the Blackrock (Marina) and Aquarium stations, if and when they arise. Information about the current service can also be obtained by calling the railway office on 01273 292718. You can visit our volunteers' association, Volk's Electric Railway Association (VERA). We hold volunteering days on Mondays, please contact the office for further information.